Book your Nice hotel now for best prices! 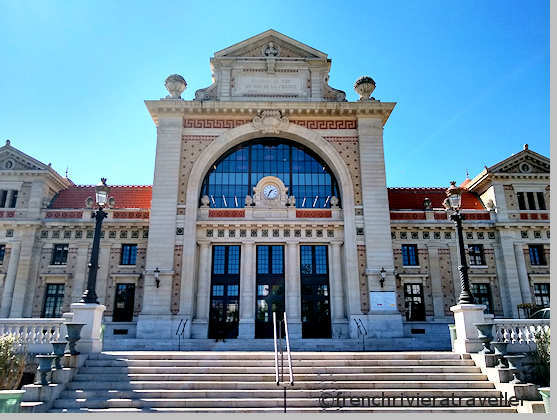 Nice's historic Gare du Sud is the centrepiece of a vast renovation project that has transformed Nice Nord. Located on the edge of the Liberation outdoor market (Tues-Sun mornings), the Gare du Sud will be all things to all people. Bookish? There's a library. Foodie? There will be a food court. Movie buff? Recline in comfy seats and take in the latest 3-D blockbuster at the Gare du Sud Cinema. Also on the schedule is a soundproof discotheque, a fitness space, cultural centre and office spaces. After years of work, the grand opening will finally take place in May 2019. The Gare du Sud was built in 1892 as a train station handling trains to Digne-les-Bains (now the Train des Pignes) and Mayrargues. Behind the striking neoclassical exterior is a spacious metal train shed topped by a glass roof. Inspired by Gustave Eiffel, the interior was created for the 1889 World Fair in Paris and was made part of the train station in 1891. After nearly 100 years of service the Gare du Sud was closed in 1991 and the Train des Pignes moved to the small Gare de Nice CP, not too far away. Then came the problem of what to do with the abandoned structure. A plan to tear it all down met with a huge outcry. A campaign to list the station as a historic monument succeeded when in 2002 the facade was protected followed by the interior in 2005. Restoration work began in 2013 following designs by the architect Pierre-Louis Faloci. The facade and front area opened in 2014. Soon after, the library Raoul Mille moved into the former station waiting room and devoted other rooms to media and digital collections. An offshoot of the landmark restaurant on Place Garibaldi, this stall will continue with the same seafood-based menu. This coffee shop is known for its cookies, pastries, bagels, muffins, salads and other light snacks as well as coffee, tea and chocolate. This cheese cellar has attracted earned plaudits for its cheese shop on Benoit Bunico street in the old town. The cheese cellar, restaurant of the Benoît Bunico street, of French gastronomy focused on the cheese, will be the cheese-cellar of the hall. Americans missing their lobster fix wll love these lobster rolls filled with guacamole, cheddar cheese or lemon butter. Italian food is the highlight here with fresh products directly from Italy. It's all Provence all the time in this grocery store based in Aix-en-Provence. Take a trip to Bangkok and sample Thai street food here, prepared by chef Nathalie N'Guyen. There are burgers and then there are Daddy's Burgers, already a hit on the Rue Hotel des Postes. Gourmet grill is featured in this stall run by star butcher Hugo Desnoyer and chef Christian Constant. Concoctions of marinated salmon, tuna, tofu and chicken with rice and vegetables recall the flavors of Hawaii. The Gare du Sud is right on Tram Line 1 at the Liberation stop.